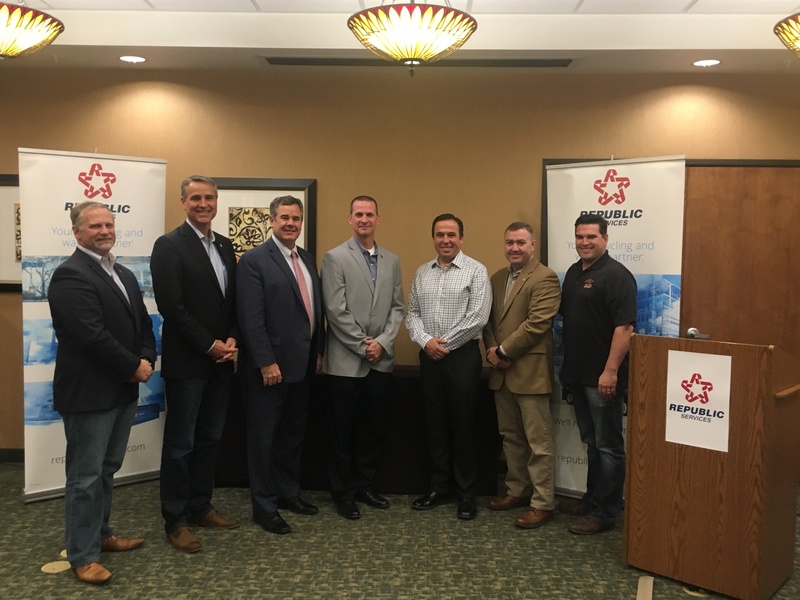 ST. GEORGE – Republic Services announced the Washington County Landfill received the World Class Landfill designation, a rigorous internal program recognizing Republic landfills that display operational excellence and environmental compliance beyond state, local and federal regulations. The Washington County Landfill is the first to be recognized among 190 landfills across the country. To achieve Republic’s World Class Landfill designation, a landfill must receive a 95 percent or higher rating for two consecutive years. 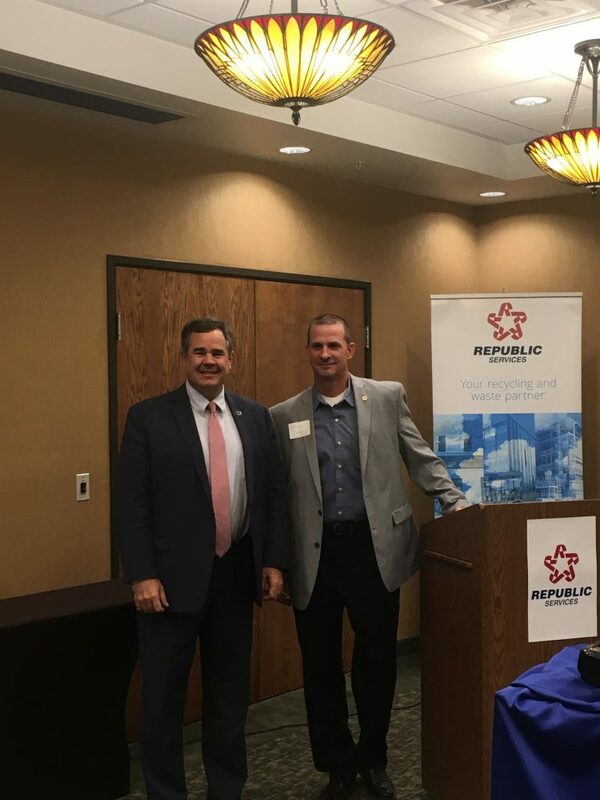 Republic Services hosted a dedication event Thursday commemorating the World Class Landfill designation with several community leaders including Washington County Commissioner Victor Iverson, the Washington County Solid Waste District board, and Mayor Pike from the city of St. George. Landfills are evaluated and rated in several main categories including Environmental and Safety Compliance, Operational and Maintenance Excellence, Planning and Training, Public Image and Employee Engagement. Responsible landfill management requires considerable science, engineering and technology to manage an evolving waste stream in a manner that is protective of the air, land and water for generations to come. The Washington County Landfill serves customers and communities throughout Washington County including Rockville, Springdale, Washington City, Apple Valley, Enterprise, Hurricane, Ivins, LaVerkin, Leeds, New Harmony, Santa Clara, St George, Toquerville, Veyo, Dammeron Valley and the town of Virgin. Republic Services has over 45 employees in the Washington County area who serve more than 55,000 local households and over 1,000 commercial and industrial customers. Republic also owns and operates 30 collection vehicles and operates one landfill. Known as the Blue PlanetTM sustainability initiative, Republic is defining its approach to environmental responsibility through decreased vehicle emissions, innovative landfill technologies, use of renewable energy, community engagement and employee growth opportunities. To view Republic’s Sustainability Report, go to RepublicServices.com/Sustainability. Republic Services, Inc. is an industry leader in U.S. recycling and nonhazardous solid waste. Through its subsidiaries, Republic’s collection companies, recycling centers, transfer stations and landfills focus on providing effective solutions to make proper waste disposal effortless for its 14 million customers. We’ll handle it from here.TM, the brand’s promise, lets customers know they can count on Republic to provide a superior experience while fostering a sustainable Blue Planet for future generations to enjoy a cleaner, safer and healthier world. For more information, visit the Republic Services website, find them on Facebook and follow on Twitter.